Before this trip to Hong Kong at the end of February to escape from the hectic work, I went to Hong Kong twice but long time ago–before Hong Kong returned to China. It was a very crowded city like Tokyo, and people walked so fast that there’s a joke about getting stepped by people behind you if you were strolling. Many people who have visited Hong Kong told me stories about how good the food there was. Since I’m a big fan of Dim Sum, it was certainly a good reason to visit Hong Kong which was the origin of it. 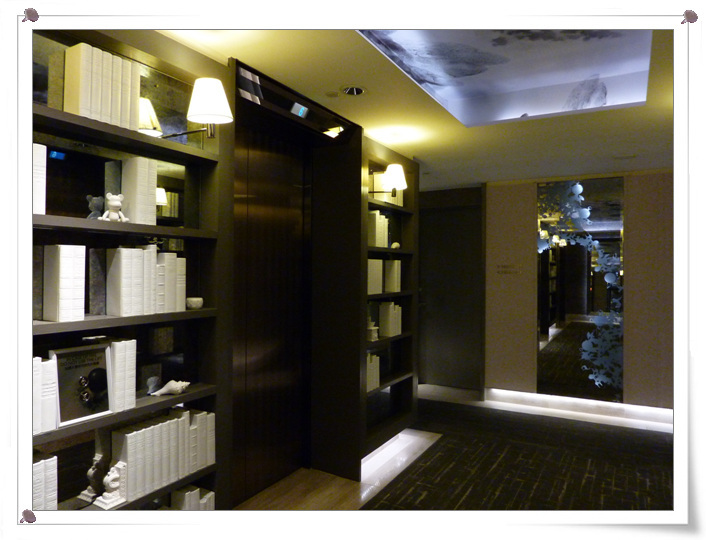 In addition, Hong Kong seemed to have a collection of luxurious hotels that priced the least in the world! 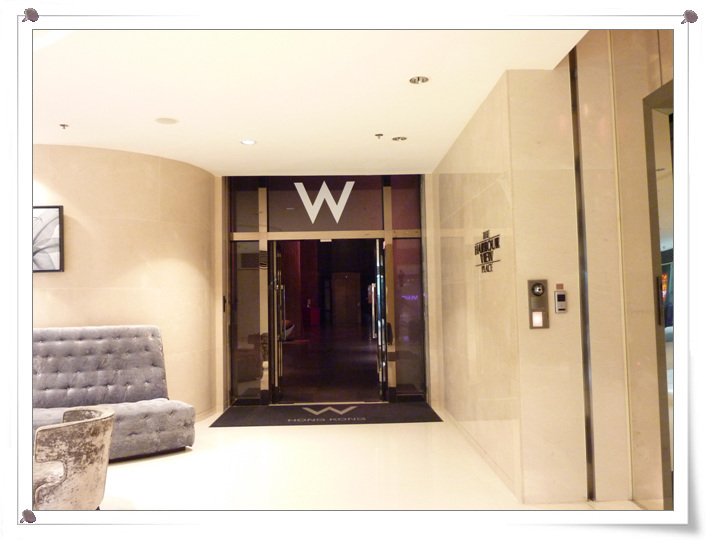 W Hotel was newly opened in Taiwan not long ago. 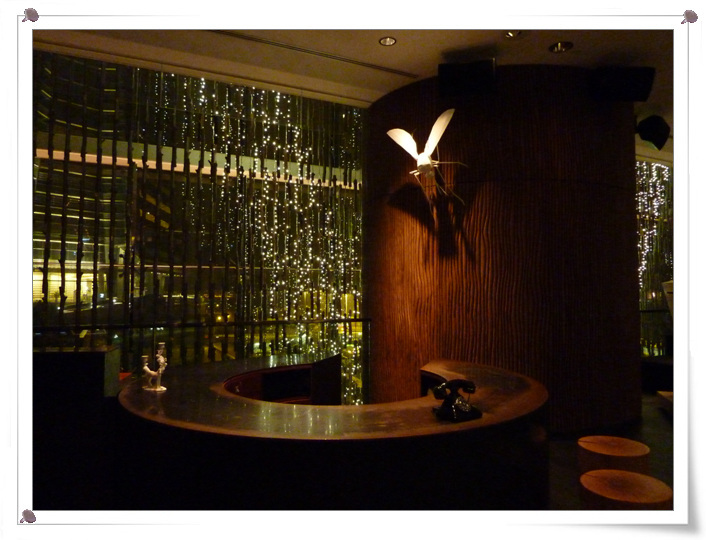 Since I hadn’t been there, judging from the low-profile exterior, I thought it’s a “Zen” themed hotel until I stepped into W Hotel in Hong Kong, the lounge-bar style and its surreal atmosphere surprised me! The entrance was “hidden” in a corner of a shopping mall called “Elements” that was also connected to the Kowloon subway station. 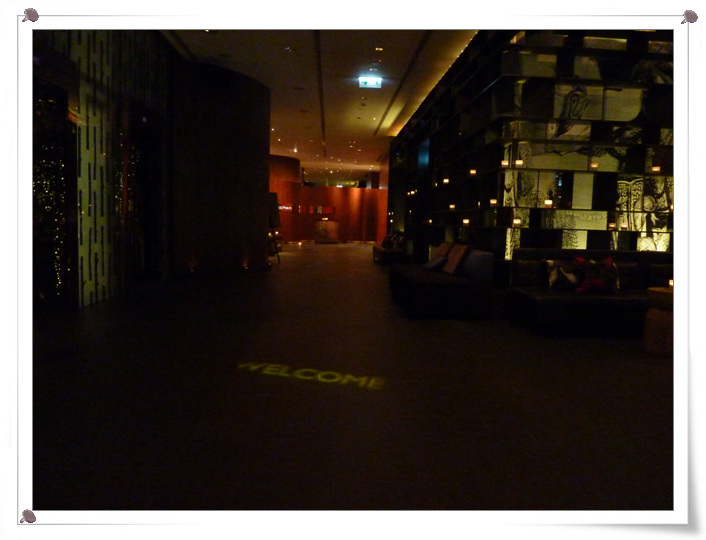 The hallway leading to the reception–I felt I walked into a movie theater! The giant mosquito(?!) displaying the logo W on the wall. The hallway led to the room got this really interesting (fake) bookshelf, and the room number was designed on an open book right in front of the door. What a change of the atmosphere from the alluring charm of the lounge bar downstairs to this serenity. The brunch taken in the hotel was delicious. This was the first meal I had in Hong Kong; usually I was not so fond of the food in hotels due to the overcharged prices and mediocre qualities. However, this was not the case in W Hotel here. The Wonton soup tasted superb with fresh chicken soup broth and the Shumai was stuffed with fresh shrimp and tuna which gave it a unique texture but flavored-filled taste. Macau was famous for its new extravagant casino/resorts majorly imported from Las Vegas these recent years. 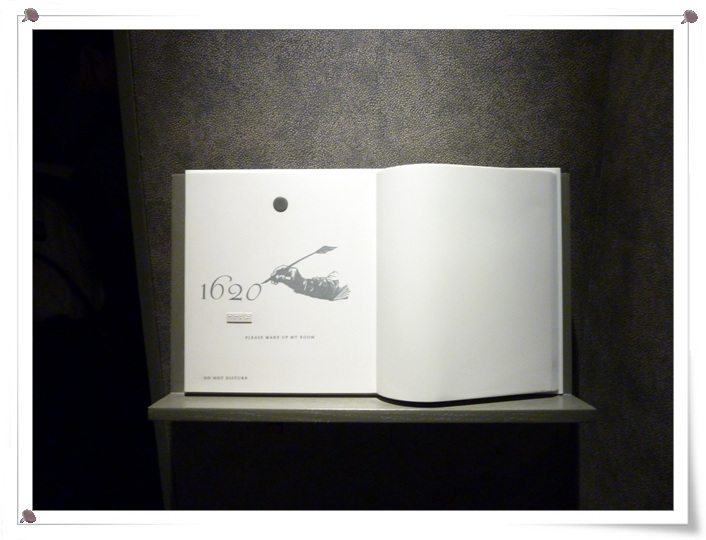 However, Macau was also full of historical and cultural heritages despite its demure size. The famous show –The House of Dancing Water. The show was produced by the producer who also has done the shows for Cirque du Soleil. This reminded me of the Cirque du Soleil show, Le Reve, that I have seen in Las Vegas. The outdoor pool was directly connected to the gym. It’s too bad that I didn’t bring my sportswear for this extremely enticing gym overlooking the swimming pool. The weather was pretty windy that day so there’s no one swimming in the pool. I couldn’t stand the crowd, so I decided to take a look at the Four Seasons hotel connected to The Venetian after consuming 3 big scoops of sorbets. The Four Seasons was indeed more relaxing as there were far less people there so you could feel the ease when you stroll through the hallways and visited its expensive brand stores. Coming back to Hong Kong, I decided to check out Lan Kwai Fang at night. It was said a really popular bar-hopping place. I wasn’t a bar-goer, but it wouldn’t hurt to bar hop a little bit sometimes. 😀 I had long heard the reputation of Ritz-Carlton. So there it was, Hong Kong’s Ritz-Carlton~The room was very spacious with a beautifully designed bathroom, and generously supplied water, fruit, coffee, and tea bags. It’s on the 111st floor of International Commerce Center building, and of course provided the “million-dollar” view of Hong Kong. What I loved the most about this Ritz-Carlton was its swimming pool. I was allowed to snap a few photos since there was no one there. It’s an indoor heated pool on 105th floor, and it even got an outdoor hot jacuzzi swirl pool. 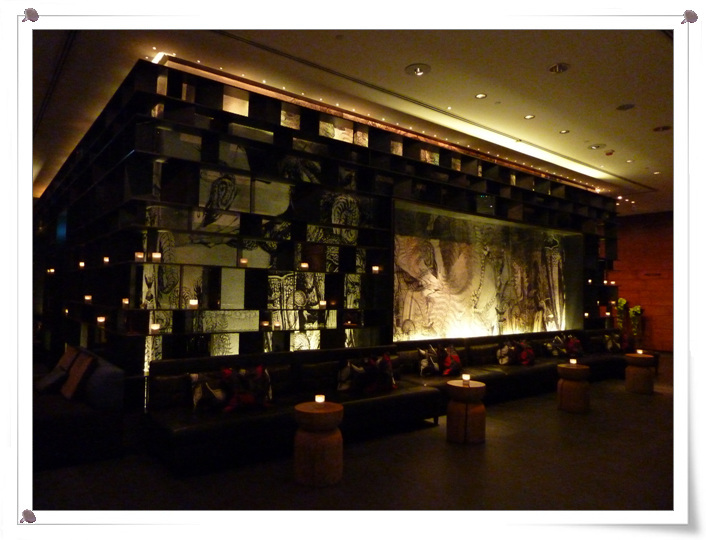 The reception of Ritz-Carlton–you’d be directed to the reception on the 103th floor. There was a telescope in the room for you to peek on someone… 😉 Although I was on the 111st floor, I didn’t feel that far from the ground actually. The mall “Elements” was convenient for shopping and dinning. It’s basically connected to the W Hotel and Ritz-Carlton with Kowloon subway station to the airport. This entry was posted in Hong Kong 香港, Macau 澳門, Travel 旅遊. Bookmark the permalink.